I t is hard to overstate the affection that a captain and crew feel for their ship. Many of the early explorations would last for years, and their ship was the only home the crew knew. This is not to say that sailors sometimes deserted when they had a chance, but many did stick with, it and great navies were built as a result. There is a reason many ships are named after women! 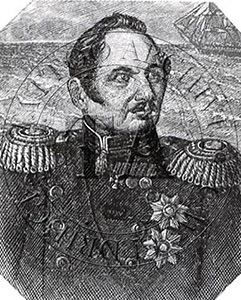 In 1819 Emperor Alexander 1 of Russia sent Baron Thaddeus Bellingshausen in command of the Vostok, to carry out the first Russian exploration of the South Pacific and Antarctic. Bellingshausen was a great admirer of Captain James Cook, as many sailors of the day were. 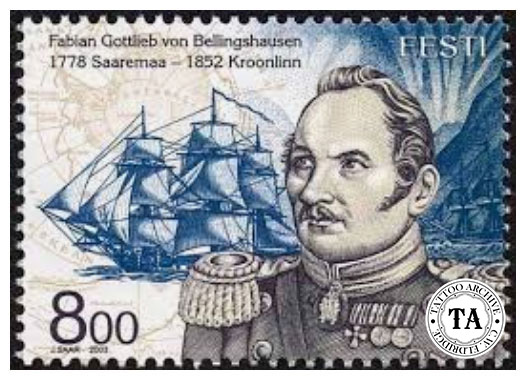 Some say that Bellingshausen's discoveries in the South Pacific and Antarctic were as important as those of Cook. 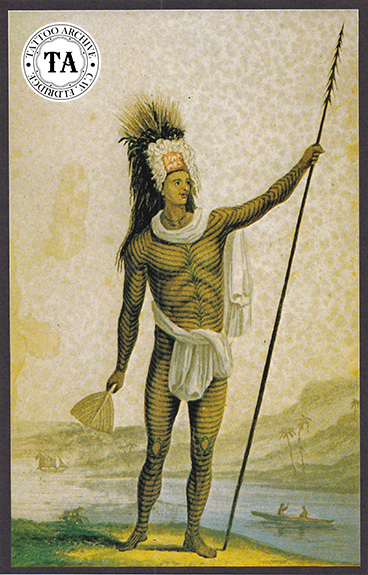 Bellingshausen and the Vostok, (variously spelled Wostok, Vostok, Vostock, Wostock, and Bostock), found their way into tattoo history with the 1820 sighting and charting of Raratonga, (Cook Islands) and Vostok Island, (Caroline Islands). The bookplate seen here shows traditional Caroline Island tattooing. Starting around the 1600s when European and other explorers sailed into the South Pacific and "discovered" an island, they just renamed it with little or no regard to what the original inhabitants might have called it. As a result, many islands were named after Kings, Queens, Earls, or even the captain's wife or daughter. Sometimes so many islands were discovered that they were named after members of the crew! However the Vostok Island is one of the very few islands named after the ship that carried the explorer to the island. The Russians were very proud of Bellingshausen and his sturdy ship Vostok. You may remember their famed 1961 spacecraft named Vostok that carried the first man into space.